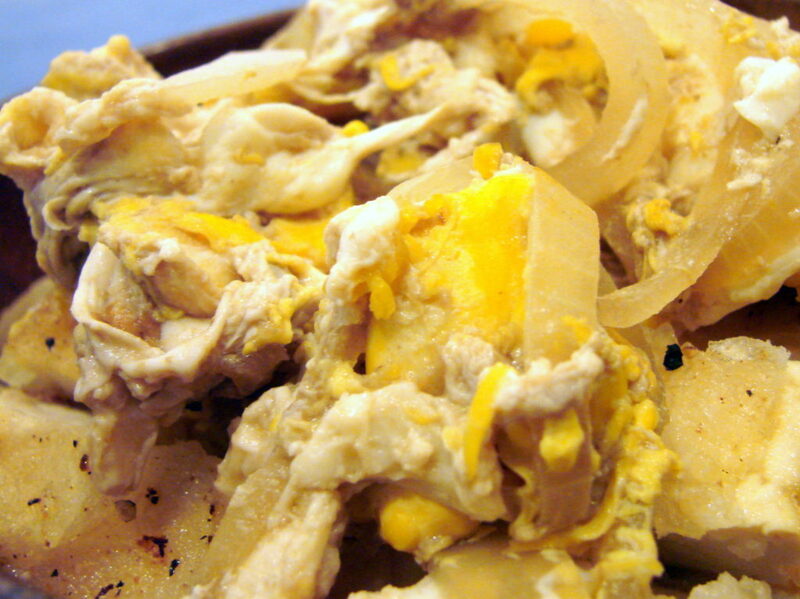 This dish is a combination of two Japanese recipes that I really enjoy: katsu-don and agedashi-dofu. The “don” is pronounced “doan,” which means something served over rice—usually in a bowl. In this case, it’s fried tofu and eggs over the rice. This recipe is for two, or one crazily hungry person. It’s very filling. Tofu-don goes well with sake, and is very filling. To begin your tofu-don, you’ll want to get your rice cooked (2 cups, dry), Japanese rice, if at all possible. If you use Uncle Ben’s, I may have to come to your house and ask in person why you would commit such an atrocity. If you have a rice cooker, just leave it in the cooker after it’s done. Jasmine rice is not a good option because it’s too fragrant and best used for Thai and Indonesian dishes. 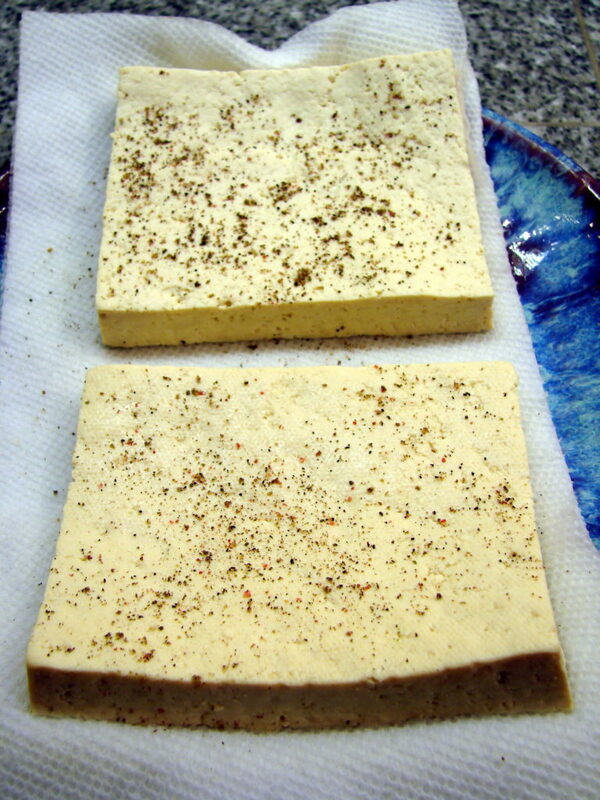 One brick of firm or extra-firm tofu, drained, split lengthwise and pressed (to remove water from it). Corn or potato starch—enough to dredge two half-bricks of tofu. Oil with a high flashpoint for frying (vegetable, peanut or canola all work)—enough for ½-inch in your heavy frypan. (You could also deep-fry if you’d like). After the tofu has been pressed and drained, cut it in half along the short edge. You will now have two thin slabs of tofu (see photo below). Pour some starch into a plate with high edges and dredge each piece of tofu, ensuring that each side and edge of the tofu is covered. Carefully lay each piece in the pan with hot oil (300 degrees F or so) and let it fry. After the first side is golden brown, carefully turn it over and cook the other side to the same level of doneness. Let it drain and cool on a wire rack. After it cools cut the tofu in to ¾-inch strips along the long edge. Next, it’s time to make the “don” part of this dish. This part of the recipe is from “Step-by-Step Japanese Cooking,” by Lesley Downer and Minoru Yoneda. It was re-published in 2005, originally published in 1985. It looks dated, but the recipes are basic old-school Japanese, and delicious. The tofu that you made. 185 ml (8.25 fl oz) water. 1 small onion, peeled and sliced. 287 ml (10 fl oz) dashi II. 50 ml (2 fl oz) mirin. 30 ml (1.5 fl oz) soy sauce. 3-4 extra-large or jumbo eggs, as fresh as you can get them. Here’s a shot of what the dish looks like when served. Make sure your rice and tofu are done and waiting. Combine the dashi, mirin and soy sauce in a good-size saucepan and bring it to a boil. Add the sliced onion and simmer till soft. 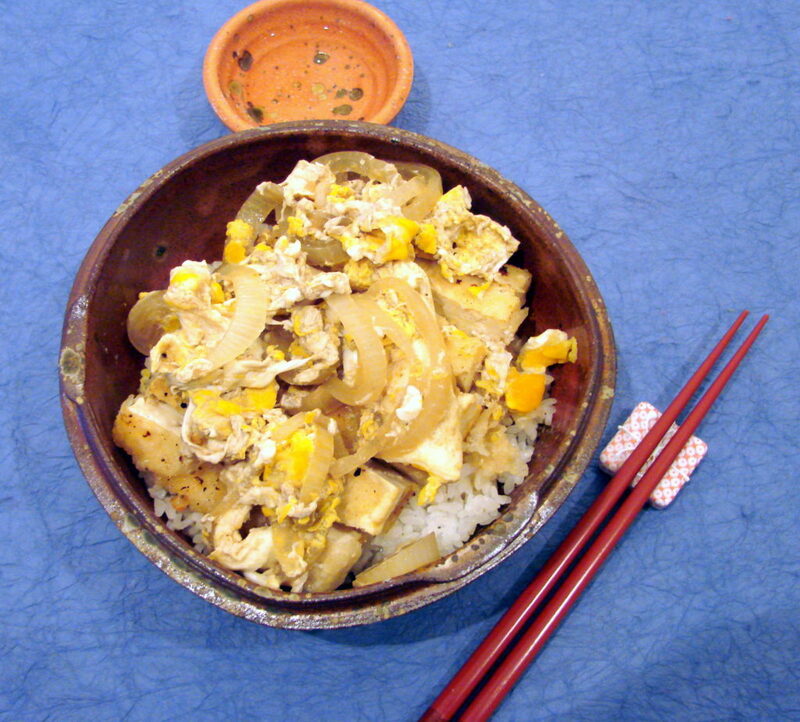 Meanwhile, fill 2 medium bowls of rice about half- to three-fourths full and arrange the tofu on top of the rice. 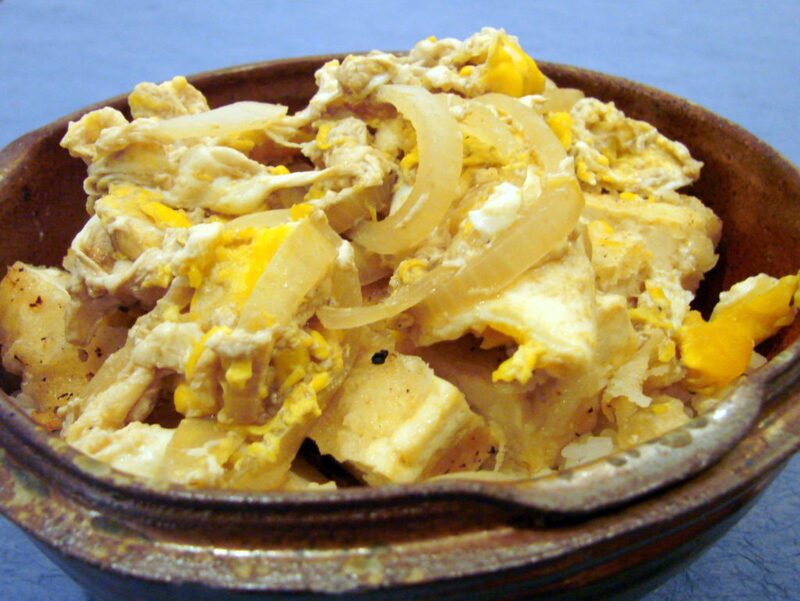 When the egg mixture is mostly cooked, ladle about half the eggs, onion and liquid across the top of the tofu and rice. Here’s a very close look at the cooked dish. In this case, I could have cooked the eggs a little less.